From the outset, Rolf de Heer's Ten Canoes has an intriguing faraway feel. We fly over acres of uninhabited land, a lush combination of swamp and bush stretching unbroken to the horizon. 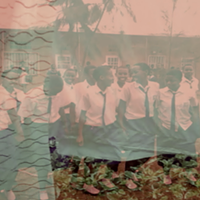 We are joined by an unnamed narrator, who explains that this is his ancestral land, and that its history is preserved literally in the land, and in the shared stories about its people. He offers to relate a particularly good tale from the past. This story, shot in black and white, concerns a pair of Yolngu, natives of this swampy corner of northern Australia, and set in relatively recent, if pre-contact times. 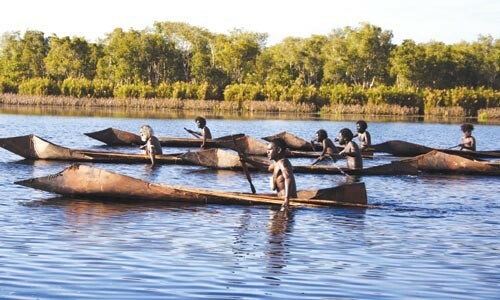 Minygululu (Peter Minygululu), along with eight men, is taking his younger brother Dayindi (Jamie Gulpilil) on his first goose-egg hunt, a several-day journey undertaken in canoes. Dayindi expresses an interest in Minygululu's attractive third wife, prompting the older man to relate another story of long, long-ago ancestors. Minygululu's story (presented in color) unfolds both the daily lives of a tribe and the dramatic fates of a few, chief among them Ridjimiraril (Cruso Kurrdal) and his younger brother Yeeralparil (also portrayed by Jamie Gulpilil), who fancies the youngest of Ridjimiraril's three wives. Intertwined with this story are digressions into rituals, myths and tribal law, and even humorous subplots and yet another layer of narrative as tribe member's speculations are visualized. Each layer of these three stories informs the others, and de Heer cuts skillfully between narrators and depicted events. Ten Canoes is hardly action-packed; it often feels dreamlike, with its effective use of ambient natural sounds and the occasional thrum of a broody didgeridoo. But both our narrator and Minygululu chide us: A good story takes time to tell. It grows, Minygululu explains, like a tree, with branches that spread out in different directions, to ultimately comprise the whole. Actor David Gulpilil is our playful narrator; he has a great joyful "ha ha" of a laugh, and relishes teasing us. Gulpilil is what amounts to a star in the admittedly small pool of aboriginal Australian actors. He began his career 38 years ago, in Nicholas Roeg's Walkabout, and starred recently in Phillip Noyce's Rabbit Proof Fence and de Heer's The Tracker. While the basic story is timeless and universal -- men, women and their all-too-common misunderstandings -- de Heer's film feels as if we've stepped back eons in time, and through some magical lens are spying on everyday people seemingly unknowable to us. De Heer worked closely with indigenous Yolngu to develop the story, and the film, in accordance with their history. Though Ten Canoes is not an explicit ethnography, you might be surprised at how much you learn about a culture that is both remote and rarely explicated, in this beautifully photographed glide among the ancients.